This is a very deceptive trailer. 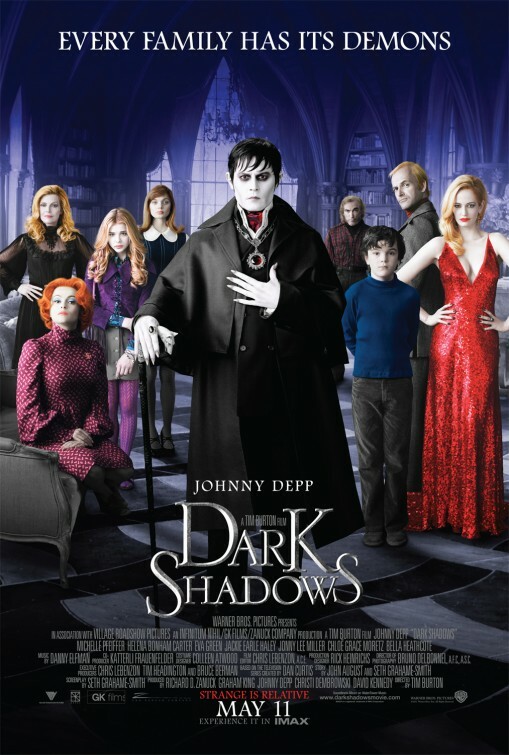 It looks for all intents and purposes as if they are taking the Dark Shadows soap opera and turning it into a comedy with the odd Tim Burton/Johnny Depp touch. Most everything that is funny in the movie is in the trailer, and often, when it is seen in the context of the movie, it is not really designed to provoke a laugh. While it might appear that the music featured in the trailer is in some way a satire, the film is not really satiric at all. The music and the images are evocative of the time and place of the films primary setting, 1972. The title scroll features The Moody Blues “Nights in White Satin”, and it is both pure seventies hokum and mystical at the same time. Most of the rest of the songs work the same way, they bring out the mood of the time period but not in the self aware and mocking style that is seen in so many other movies. The song score reflects events and place for the audience, but more on this later. When I was a kid, I remember seeing Dark Shadows on TV, it was a late afternoon soap opera that had Gothic and horror elements to it. While I would drop in from time to time, it was not a must see and I have very little recall of the story or other characters. Barnabas Collins was the only character I remember and the only one that I wanted to see. The problem for a kid my age was that there was way too much exposition and not enough of the horror of a vampire sucking the blood out of people. The current film tries to remedy this by putting in several bloody killings and some other supernatural gibberish to keep us hooked on the story. The set up goes very quickly and it was done with a good deal of panache. The tragic history of the Collins family is revealed and the fate of Barnabas is transferred to the Twentieth century almost immediately. This sets up the only comedic elements to the story, a fish out of water plot device that almost always provokes chuckles when used right. The arcane manner of speech and the lack of familiarity with modern conveniences, put the Johnny Depp played Barnabas at the center of any jokes. It is not long into this story that most of those jokes slip away and we are mostly returned to a soap opera horror story. This movie is more like a soap opera than any other kind of genre. There are small town intrigues that keep the locals a part of the story but always in the background. We have mysterious visitors who keep their true identities secret until a crucial point in the plot line. There are outrageous plot twists that seem to have nothing to do with the main story and often trail off into nothingness. Sometimes those plot twists are designed to distract us from what is obviously coming and sometimes they are there to fulfill our expectations of the genre. In the last section of the movie, there are reversals and surprises that have virtually nothing to do with the main plot. They exist to give other characters something to do and bring the audience something to enjoy. The only soap opera convention that was not a part of this film was the “evil twin” trope, which will probably be first paragraph if they ever decide to do a sequel to this film. I like Tim Burton and Johnny Depp together, but there have been misfires before. I disliked the “Alice in Wonderland” from a couple of years ago, but thought “Sweeney Todd” was great. There is a real feeling in the movie that they wanted to tell a real story and be true to the source material. The humor is needed to sell the film to an audience that loves Johnny Depp as a quirky character. Most of the time here, there is a real character that is odd only in context. When a joke is layered on top of that, it feels like the point of the story is lost. All of the visuals are really solid, and the moody “Collinswood Manor” is nicely imagined. The historical scenes and those featuring a 1970’s vibe work pretty well with the lighting and the music. The jokes mostly have nothing to do with the story and simply reflect the absurdity of taking any of this seriously. This feels self defeating in a lot of places. Our investment in the characters is not enhanced by the humor, it undermines our ability to care much about the outcome. The film makers continue to act as if we should treat this seriously and then another weird development comes along to side track us. Except for the little boy David Collins, the modern family Collins is a waste of talent. The actors are fine but Michelle Pfieffer has virtually nothing to do for most of the story. She is exposition central for the current events of the family but plays no active part except at the end and that feels tagged on. Also tagged on is the plot line that Chloe Grace Moretz ends up enduring. She plays bitchy and odd very well but the point of it all is lost on me except that it feels like a typical soap opera ploy for more distraction in the background. The idea that Barnabas is going to restore the family is a good plot device, but after we see a montage of building and construction projects we have no idea what is happening. Eva Green as the villainous witch Angelique is beautiful in a overdone soap opera manner. She also goes over the top for very little purpose and we are never sure if the people she works with are aware of her powers or not. As with most material like this, the continuity of the story is less important that getting to the next dramatic scene. I enjoyed the song score, there are several nice 70’s era hits interspersed in the story and background. “Superfly” makes very little sense put was great to hear. The same could be said for the “Carpenters”. There is a ball sequence that accomplishes nothing except getting Alice Cooper in the movie and making a pretty weak joke out of it. The Danny Elfman score was appropriately moody. I thought it fit the creepy tone of the Gothic story elements really well. The problem was not with any one element of the movie but with the odd way that it is all supposed to fit together. Ultimately, I thought it failed to be as memorable as a fan of any of these elements could want. 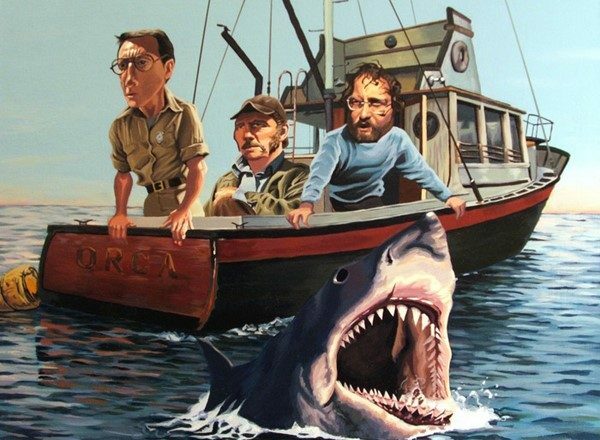 It does not disgrace the memory of the TV series but it also does not make you want to go back and see it again.